Interested in switching to geothermal? This system is cost effective, energy efficient, and environmentally friendly. The following article will explain how geothermal works and the benefits of using this type of unit. Geothermal HVAC systems use the natural energy that the earth provides for much more efficient operation. While the climate of the air fluctuates all year around, the temperature below the ground almost always remains the same. Standard HVAC systems need to expend extra energy to cool the hot summer air or heat the home during frigid winters. Geothermal systems save energy by taking advantage of the consistent temperature underground. The ground’s temperature remains stable all year because it absorbs almost 50 percent of the sun’s natural energy as it hits the earth. Geothermal systems convert this free energy into heating and cooling for your home. For the heating cycle, the geothermal heat pump extracts heat from underground and delivers it to your home as warm air. It can be distributed through a conventional duct system, radiant floor system, or domestic hot water pipes. For the cooling cycle, this process is reversed. The heat pumps instead extract heat from your home and either distribute it back into the earth or use it to heat your hot water tank. This helps create cool, conditioned air throughout the home. Geothermal systems are designed in three different ways: All-In-One, Splits, and Hydronic. All-In-One Systems offer heat during the winter months and cool air during the summer months by replacing the common appliances (indoor furnace and outdoor air conditioner) entirely. All-In-One systems are recommended for those that want the utmost in energy efficiency and savings at a higher initial investment. Splits Systems operate by partnering with the traditional furnace and/or remote air handler for increased efficiency. This type can be used in the entire home or individual areas. 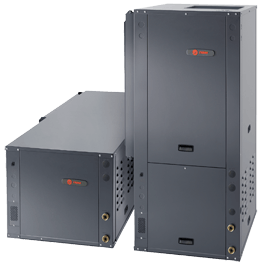 Splits are recommended for those that want to boost their current furnace system and need flexibility in choosing individual rooms for energy efficiency. Hydronic Systems work with heating and cooling water units such as radiant floor heating and domestic hot water. Geothermal systems have been called many different things throughout the years. The following names all refer to the same process: geothermal, geoexchange, ground water assisted, ground water source, water to water, and water furnace heating and cooling. Geothermal systems are energy efficient, cost effective, environmentally friendly, and often considered to be the world’s greenest heating and cooling option. Research by the Environmental Protection Agency and The United States National Renewable Energy Laboratory find this to be true. In comparison to traditional HVAC systems, geothermal units save homeowners up to 70 percent the monthly cost and deliver five times the energy. For additional savings, switching to geothermal can often earn customers federal, state, or local tax credits. This type of system operates more quietly than conventional systems and offers more precise distribution without heat blasts or cold spots. Because these units are installed indoors, they are less vulnerable to damage from the elements and generally require less maintenance. In addition, geothermal systems emit zero amounts of carbon dioxide, carbon monoxide, and other greenhouse gases. The Department of Energy and the EPA reports that these do not contribute to air pollution. For homeowners in the Berks County area, B&L Ott is available to install geothermal HVAC systems that meet your personal heating and cooling needs. Our certified technicians will provide a thorough consultation, a detailed explanation of your options, and excellent installation. In addition, tax federal tax credits are now available for homeowners that switch to geothermal through the The Energy Improvement and Extension Act of 2008 (HR 1424). Contact us today to schedule service.